US music star Kid Rock is refusing to put his albums on iTunes because he says artists do not get paid enough for downloads from the Apple store. Kid Rock is one of the last few acts not fully signed up to the service. He said it was based on "an old system, where iTunes takes the money, the record company takes the money, and they don't give it to the artists". His latest album Rock 'n' Roll Jesus went to number one in the US last year, despite being absent from iTunes. The Beatles, Garth Brooks and AC/DC are the only other major stars who have still not made their music available on iTunes. 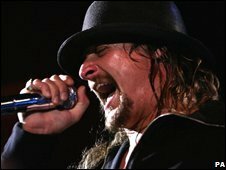 "Back in the day, we all know the stories of the Otis Reddings and Chuck Berrys and Fats Dominos who never got paid," Kid Rock told the BBC News website. "So the internet was an opportunity for everyone to be treated fairly, for the consumer to get a fair price, for the artist to be paid fairly, for the record companies to make some money." But they stuck to the "old system", he continued. "I will be on iTunes eventually because I can't avoid it, but I like to always stick to my guns and prove a point and do something original and because I believe in it." His new single All Summer Long has, though, just been made available on iTunes in Europe and will be downloadable in the UK soon. The rocker, who was famously married to actress Pamela Anderson, said he was losing 10-20% of album sales by not being on iTunes. But he added: "I've just sold a million records, I'm not really feeling that blow." The performer - whose real name is Robert Ritchie - said his record company Atlantic had asked him to "stand up for illegal downloading" a few years ago because it told him "people are stealing from us and stealing from you". "I was telling kids - download it illegally, I don't care. I want you to hear my music so I can play live." Asked whether he was worried about illegal downloading, he replied: "I don't agree with it. I think we should level the playing field. I don't mind people stealing my music, that's fine. But I think they should steal everything. "You know how much money the oil companies have? If you need some gas, just go fill your tank off and drive off, they're not going to miss it." But he said he did not implement that advice himself. "No, I don't steal things. I'm rich." Apple and Atlantic declined to comment. The only Kid Rock album on iTunes is his 1990 debut Grits Sandwiches For Breakfast, to which he does not own the rights. Garth Brooks, who is second to The Beatles in all-time US record sales - ahead of Elvis Presley - has also refused to join the iTunes revolution. He wants fans to download only full albums because he says each album is a complete work and the songs are designed to be heard together. "We do albums, we have always done albums," he recently told the BBC News website. Referring to songs from his 1990 album No Fences, he continued: "Friends in Low Places is not Friends in Low Places without Wolves or Wild Horses. "And if people try to make it a money issue, I can get the full album to the consumer for much less than they can get it at 99 cents a song. "There are a number of issues that need to be addressed in the digital downloading world before we introduce our music to it." iTunes has overtaken supermarket group Wal-Mart to become the largest music retailer in the US, an independent study has said.